I haven't been drinking coffee lately. I had given up caffeine for about a year and then decided over the summer that I would add in some caffeine and see how it went. I loved drinking coffee again and limited it to two cups a day maximum but then decided that I should stick with tea. Its just too easy for me to over do it with coffee however with tea I can drink more and not feel jittery. My favorite green tea is one with Jasmine flowers. It is lovely but I still wanted to branch out. I have wanted to try Matcha since a friend on Facebook, who is a yoga teacher and is like minded in health ideas, posted pictures of matcha. I have been intrigued since then. 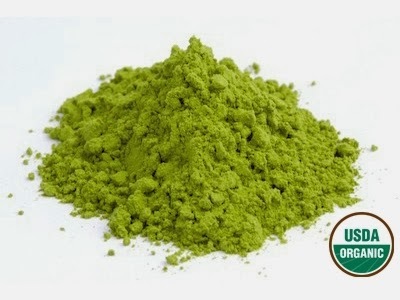 I am so glad I discovered Organic Matcha Green Tea Powder . I don't always choose organic since it can be more expensive. For instance I will buy vegetables to eat even if they are not organic. Non organic veggies are better than no veggies but I do try to do organic when I can. Unfortunately tea is heavily laden with pesticides. Since its a more concentrated product I very much like that it is organic. Matcha gives you all day energy and boosts the metabolism. Matcha uses the whole tea leaf and has 137x the antioxidant power that regular green tea has. 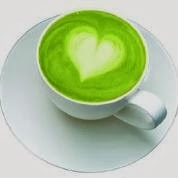 Matcha is not fermented and the tea is grown in the shade giving the leaves the dark color and the reason it has such magnificent amino acids.
" Chill Out. You know that regular green tea is advised to those suffering from anxiety or insomnia, but did you know that matcha was originally used to help Buddhist monks during periods of intense meditation? Matcha contains much more L-Theanine, an amino acid that promotes relaxation and well-being within the brain, than other green or black teas." 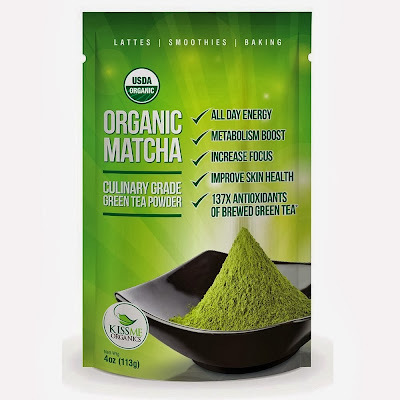 Download a free Oraganic Matcha Recipe Guide with 50+ recipes inside from KissMeOrganics! Its full of drinks, baking, and smoothie recipes that look fabulous. I personally like to add matcha to hot cocoa. Some of the other recipes are for Minty Matcha Mojito, Matcha Latte, Berry Good Morning Smoothie, Lemon Matcha Waffles, Matcha Frosting, Jalapeño Matcha Cornbread, Tomato Basil Matcha Pizza, and so many more! There isn't a recipe in the book that doesn't look good to me! Check out KissMeOrganics Matcha green tea for sustained energy with added health benefits! Have you tried Matcha? What did you think? Let me know in the comments!